Piggy puppets go flying as the big bad wolf pretends to blow them away, and my two preschoolers giggle delightedly. Not bad for a few scraps of yarn, right? 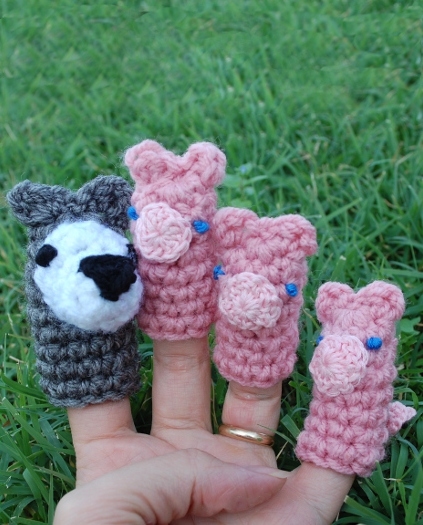 These simple puppets have been designed to eliminate as much assembly as possible, with ears and tails crocheted right onto the little yarn bodies. Because who has time to sew when the wolf has houses to blow down? 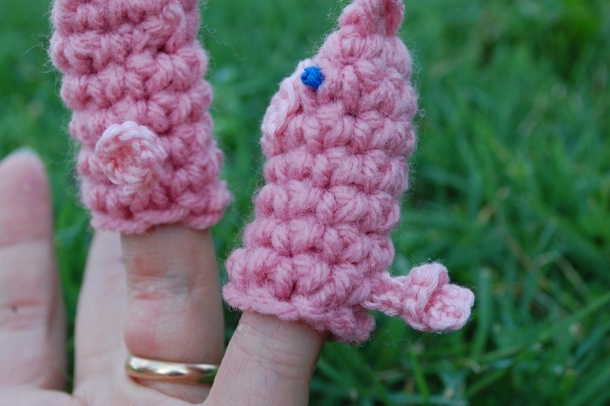 Gauge: Gauge is not significant in this design – just make sure your puppets fit on your fingers! Note: Puppets are worked in a continuous spiral, do not join rnds unless directed. Sl st 2 sts, finish off. Caution: this is a left-handed illustration. 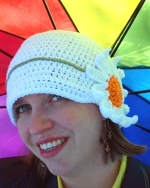 Right- handed crocheters may need to mirror the image. With pink embroidery floss and small hook join at back, wherever you’d like the tail to be. Ch 11. 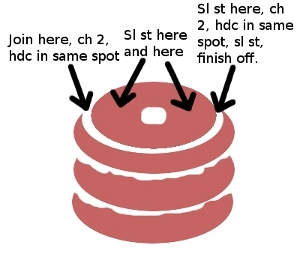 Make 2 sc in each ch across. Finish off, secure to puppet body. With pink embroidery floss and small hook, ch 3. Make 12 dc in 3rd ch from hook, join rnd. Finish off, leaving a tail of thread. Sew nose to pig body. With blue embroidery floss, embroider eyes where desired. Rnds 2-10: Sc in each st around. Rnd 1: With white yarn and larger hook, make a magic loop. Place 8 sc in center and pull tight. Rnds 2-3: Ch 1, sc in each st around. (8 sc) Join rnd. Row 4: Ch 1. Working in front loop only, place 2 sc in each of the next 5 sts. Finish off. With gray join for ears (see pig diagram for help). Ch 3. Hdc in same spot, sc in same spot, sl st in next spot, sc in same spot, hdc in next spot, ch 3, join at base of stitch, finish off. Stuff nose, sew to body. Weave in ends. With black yarn, embroider nose and eyes.